This Month, BoBunny is sponsoring the DT at Sketchbook 365 and each one of us got one of their new collections to play with. I received the Autumn Song collection and all I have to say is that its gorgeous. 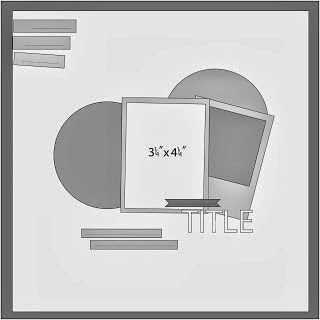 Below is the sketch we used as inspiration and we hope you come join us and play in this month’s challenge. BoBunny is a family owned and operated company. They are an industry leader, producing wonderfully eclectic ranges of paper and co-ordinating accessories. It all started with two designs in a single store and now this wonderful range can be found in over 38 countries!! This is a picture of my son sitting on a large fallen tree. I framed the picture with a frame from the BB frames and tags paper. Then I fussy cut some other images and layered them under the photo. 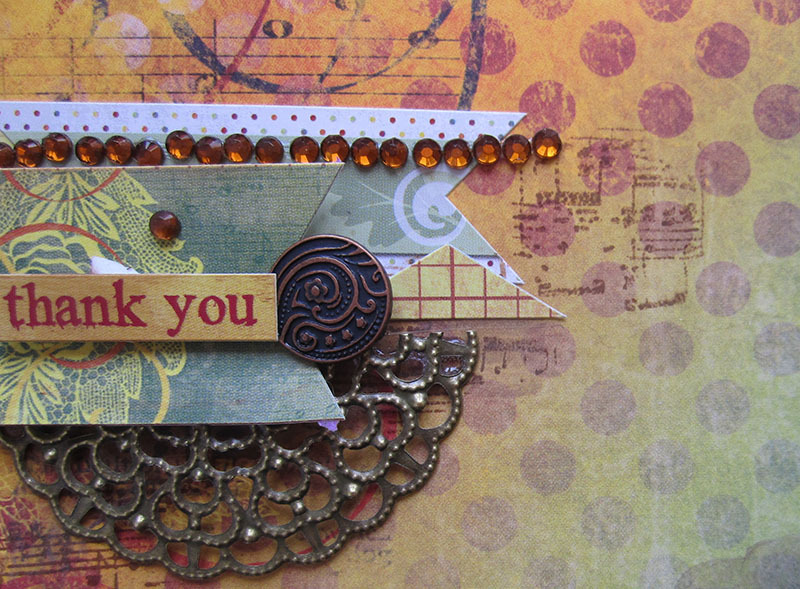 I used a music note stamp from the Autumn song collection to stamp a pattern underneath all the layers. I used some of the BB metal embellishments and gemstones. I also used some metal butterflies from my stash that I layered on top of the flowers. 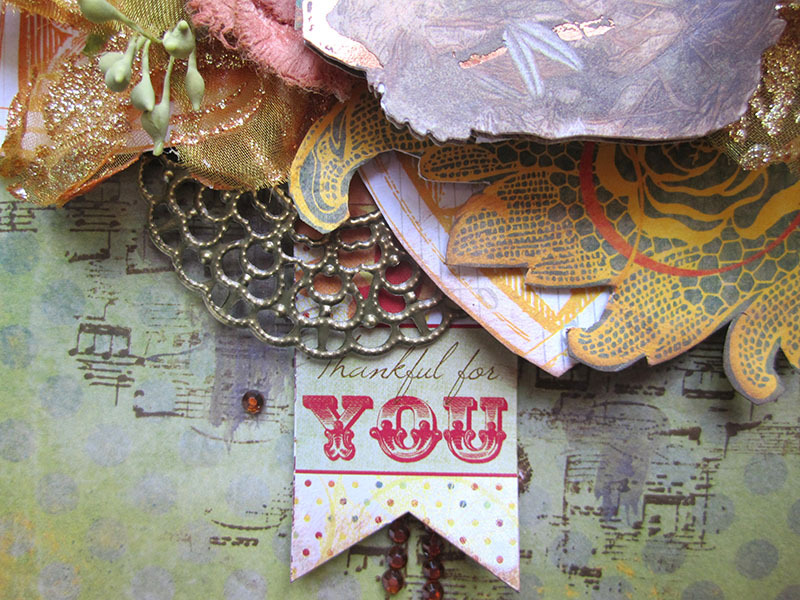 I found these beautiful doily-like embellies in my stash and I cut them down in half to add as layers across the page. A beautiful take on the sketch Keren. Loving the beautiful layering of the elements. 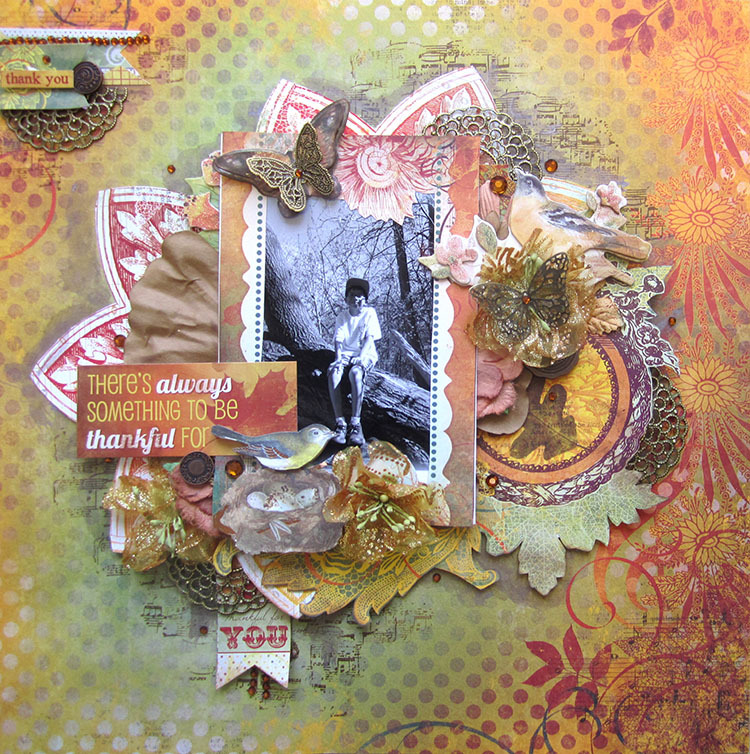 so gorgeous Keren…love all the layers and your beautiful details! Keren the BB collection is really beautiful, thanks for showing us this layout that's full of ideas and detail. This is gorgeous! I love love love love the layers, the colors and loveeeeeeeeeee the butterflies!!!! It's such an amazing lay-out full of gorgeous layers and details. Absolutely amazing work! 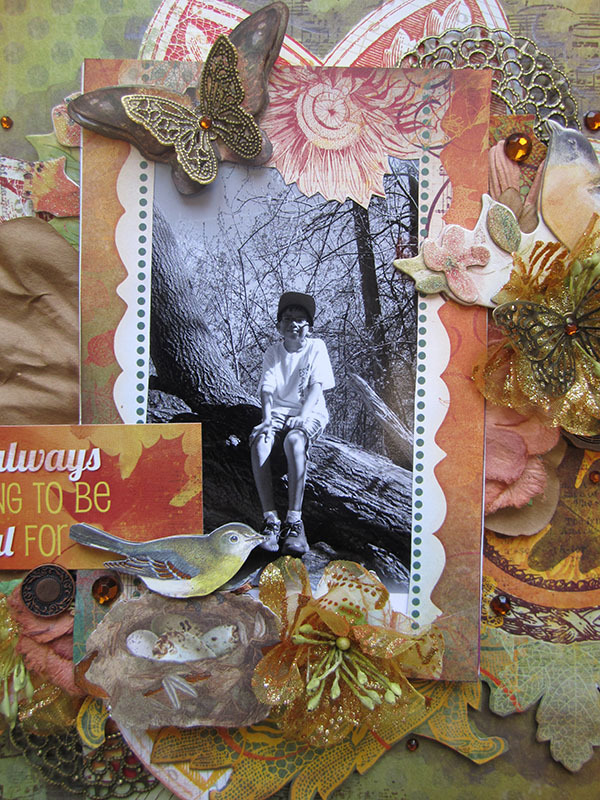 This is totally gorgeous Keren – lovely papers and love all your layering!! stunning page cool details and layers. Just LOOOVE these tones…it does go sooo well with the snap & those metal em bellies……YUM….wouldn't be a 'you' page without a butterfly:):)!!!!! A neat design and background! 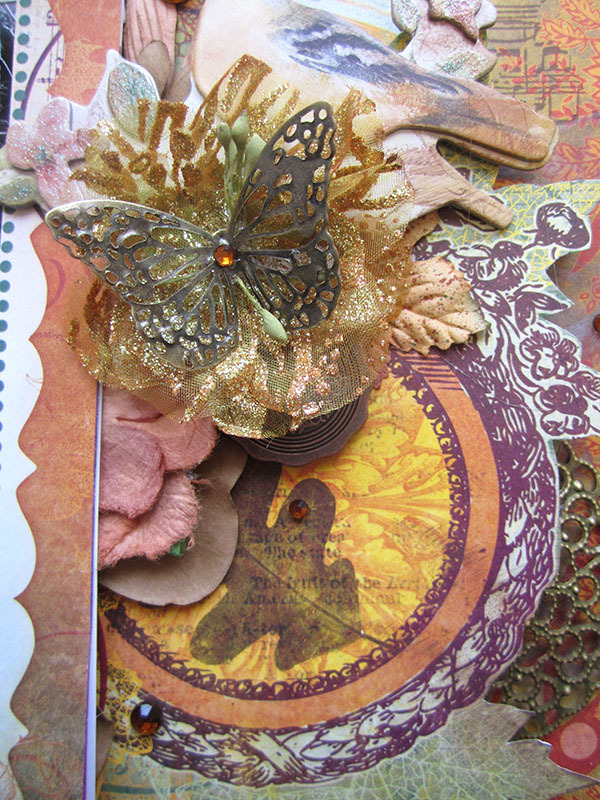 Love the rich autumnal colours, and all those fabulous gold filigree elements – brilliant, Keren! Very special! love the autumn colors and your son's photo.